Montjeu was foaled on 4th April 1996. A bay horse standing 16.1 hands (65 Inches) Was bred in Ireland by Sir James Goldsmith, who named him after his chateau outside Auten in France. Montjeu was sired by the fourteen times Britain and Ireland champion sire Sadler’s Wells, out of the group 3 Prix De Lutece winner Floripedes. The colt was sent into training with John Hammond at Chantilly. Sir James Goldsmith died in 1997 before the colt began racing, and his ownership went to Tsega Ltd, owned by Laure Boulay de la Meurthe, mother of two of Goldsmith's children. Montjeu made his racecourse debut on 18th September 1998 in the Prix de la Maniguette over one mile at Chantilly and beat nine rivals by one and a half lengths. A month later, he was moved up to listed class, in the the Prix Isonomy at Longchamp over one mile and one furlong where he faced two rivals and won by just under a length. At the end of 1998, a half-share in Montjeu was sold to John Magnier and Michael Tabor. Montjeu started off his three-year old campaign on 25th April, at Longchamp in the Group Two Prix Greffulhe over one mile, two and a half furlongs. He faced six rivals and won by one length from Sendawar, who went on that year to win (French 2000 Guineas and St James Palace Stakes). On 6th June, Montjeu faced six rivals in the group 1 French Derby. Cash Asmussen took the lead two furlongs from home and drew away from his opponents to win by four lengths. Three weeks later, Montjeu was sent to the Curragh for the Irish Derby where his main rivals appeared to be the English trained colts Daliapour and Beat All who had finished second and third respectively in the Epsom Derby. Montjeu was held up early before moving smoothly through to dispute the lead in the straight. He took the lead a furlong from the finish and pulled clear to win by five lengths. Montjeu was then given a planned break of more than two months before returning in the Prix Niel at Longchamp. Ridden for the first time by Mick Kinane, he was last of the four runners entering the straight but moved forward to take the lead in the closing stages. In the Prix De L’Arc De Triomphe three weeks later, Montjeu started 6/4 favourite and faced thirteen rivals on unusually heavy ground. He turned into the straight in fifth place before being switched to the outside. By this time however, the Japanese challenger El Condor Pasa had opened up a three-length lead, and Montjeu had to be driven out to catch him. Montjeu overtook El Condor Pasa half a furlong from the finish and won by half a length. Montjeu stayed in training as a four-year-old. On 29th July, he ran in England for the first time in his career when he contested the King George and Queen Elizabeth Stakes at Ascot. Montjeu showed signs of temperament in the preliminaries, as he refused to enter the paddock. Starting at odds of 1/3 he cruised into the lead in the straight and won very easily by one and three-quarter lengths from Fantastic Light. Brough Scott, of the Daily Telegraph described the performance as devastating, and compared Montjeu to past champions such as Ribot, Nijinsky, Mill Reef and Shergar. He was made odds on favourite to win his second Arc in October. He failed to reproduce his best form however, and finished fourth to Sinndar. On his final racecourse appearance three weeks later he finished seventh behind Kalanisi in the Breeders Cup Turf. At the end of 1999, Montjeu was voted that year's Cartier Three Year Old European Champion Colt and World Champion. Montjeu was given an official rating of 135 by the International Classification, making him the highest rated three-year-old of the season, although some, including the Racing Post, felt that the rating underestimated his achievements. Timeform concurred, giving him a mark of 137 in 1999 and 2000. In 2001, Montjeu was retired to Coolmore Stud, in Ireland. There are few stallions in the history of thoroughbred breeding who had such a spellbinding start at stud as Montjeu. In his first crop, he had Motivator, winner of the Racing Post Trophy as a two-year-old, and the winner of the 2005 Epsom Derby, as well as the runner-up in the same race, Walk In The Park. Hurricane Run the winner of the Irish Derby, Prix de l’Arc de Triomphe, King George and Tattersalls Gold Cup. Scorpion the winner of the Grand Prix De Paris, Coronation Cup and St Leger. 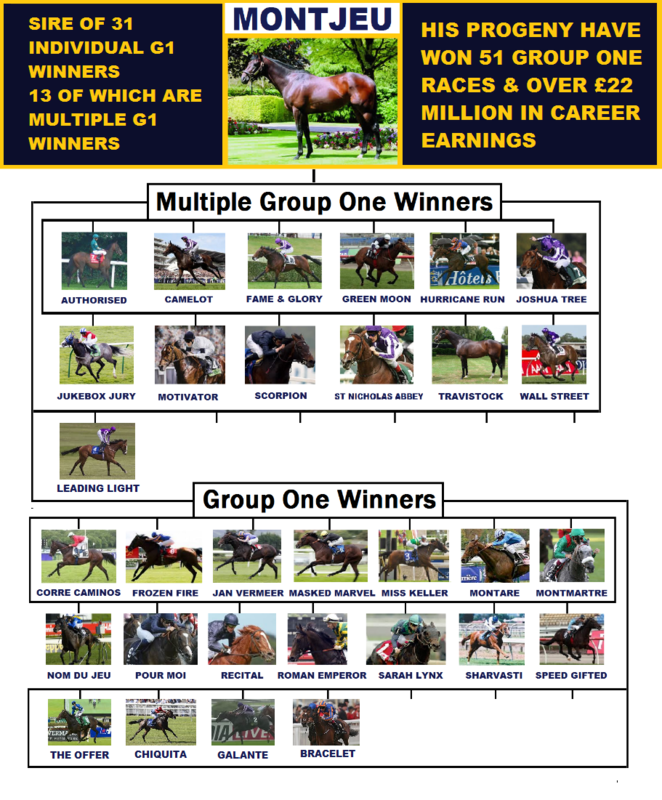 A total of seven Gr 1 winners in his first crop, including winners foaled from his first season in the southern hemisphere. This was a start that every sire owner dreams of. It was no wonder that after such a performance of three-year-olds, Montjeu’s fee grew from €45,000 to €125,000 for which he was offered for three consecutive season before becoming Private. The following crops maintained the high standard. Especially the results of his progeny in staying races were excellent, including the Epsom Derby. After Blandford, Montjeu was the first stallion to produce four Epsom Derby winners (Motivator, Authorized, Pour Moi and Camelot), the same number of victories was achieved in the Irish Derby (Hurricane Run, Frozen Fire, Fame And Glory and Camelot), there were three victories in the St Leger (Scorpion, Masked Marvel and Leading Light). Four of his sons won the Racing Post Trophy and three of them, went on to win the Epsom Derby. 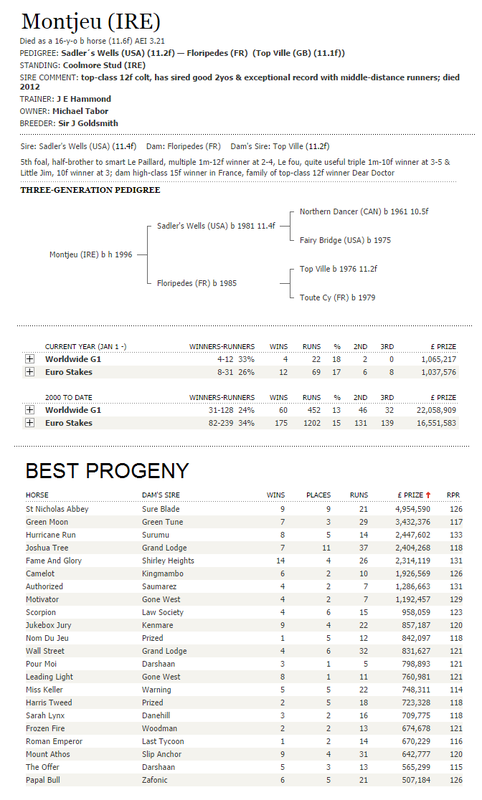 Another great sire by Sadler’s Wells, and we will watch and write on his grandsons and great grandsons on what they achieve in years to come.